A mad man drives a rented truck into civilians in New York last night, killing 8 and injuring 11. 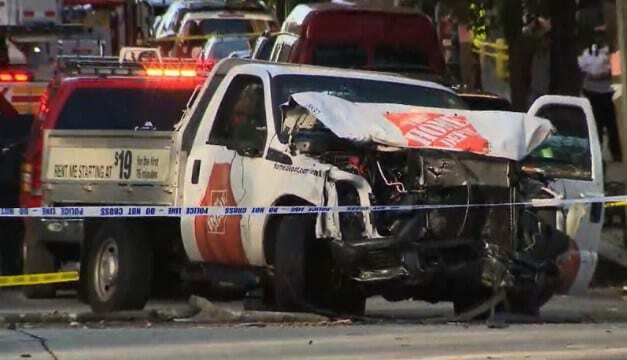 A rented Home Depot truck, plowed into pedestrians, like a scene from Grand Theft Auto on Manhattan’s West Side Highway bike path, near the World Trade Center. Eight people were killed and 11 people have been seriously injured, by a madman on a rampage. A 29-year-old man, reported to be an Uzbek immigrant, was shot and injured by police as he left the vehicle trying to escape the scene. He is under arrest. A pick-up truck drove along a cycle path in New York, killing eight people at the scene. The Vehicle which was driven by an Uzbek National struck cyclists and pedestrians, in Grand Theft Auto style rampage. Driving down several blocks along the West St-Houston St path, in Lower Manhattan, before coming to a halt as it hit a school bus. A further 11 people have been seriously injured. Officials have already determined that this terror attack has been carried out by the Islamic State, as the victim left a note in the hire vehicle where ISIS have claimed responsibility. As it stands it is unclear what the entire message was on the note but it was written in English and sketchy reports suggest that the suspect says he carried out the attack ‘for ISIS’, not ‘on behalf’ of ISIS. The suspect lived in New Jersey but also has connections in Florida. In the meantime local authorities have named the attacker as Sayfullo Saipov, a 29-year-old Uzbek national who came to the US in 2010. Officials described the incident as a terror attack and President Trump has immediately wowed to “step up” vetting measures for visitors to the US following the attack. And Barack Obama has also tweeted his support for the New Yorkers. New York Gov. Andrew Cuomo just tweeted this photo of One World Trade Center and said, “New York is an international symbol of freedom and democracy, and we will not be deterred.” The spire is lit up in red, white and blue.